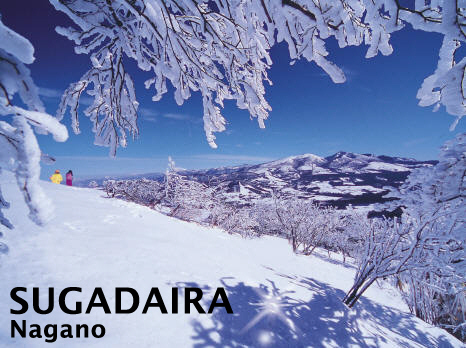 Sugadaira, located in the heart of central Nagano Prefecture, is a popular ski and snowboard resort with a wide range of courses, regular powder snow conditions and spectacular views of the surrounding regions. 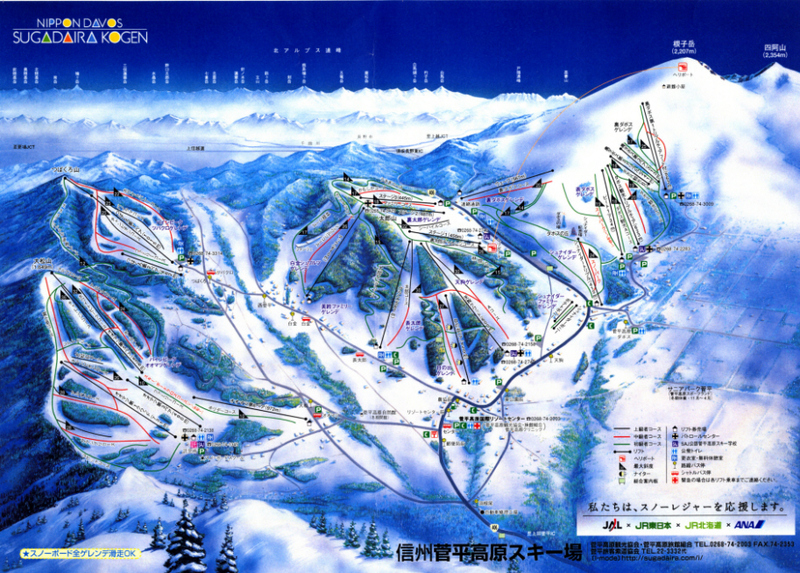 The resort is divided into three main skiing and snowboard areas which are called "Pine Beak Area", "Taro Area" and "Davos Area". For more information about the resort and the facilities on offer, please click on the link below. 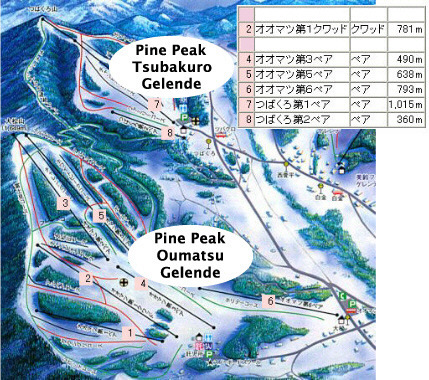 Sugadaira Kogen is a popular local resort with long, wide slopes that are particularly suitable for learner skiers and snowboarders and families. There are a wide range of runs on offer during the season which runs from early December until early April. The small resort town of Sugadaira has a number of shops and ski equipment rental shops featuring skis, snowboards, boots and poles. 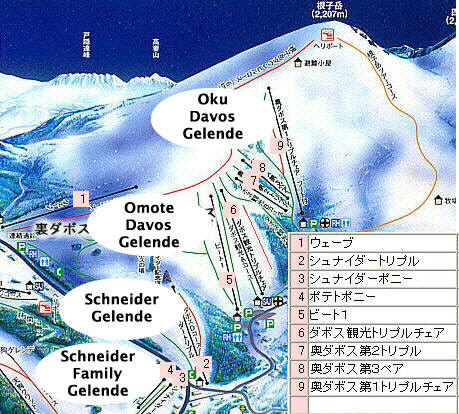 There is a wide variety of of traditional pensions, lodges and Japanese-style hotels on offer in Sugadaira, with many of them offering ski in ski out accessibility. There are a few other winter-related activities that skiers and non-skiers alike can take part in, such as hiking, snowshoeing and heli-skiing. Spa facilities are available at some of the top pensions and après-ski can be enjoyed at the on-slope restaurant and several restaurants and bars in the village. By car, the resort is easily accessible from both the north and south. From the south, take the Joshietsu Expressway, get off at the Ueda Sugadaira IC and head north on Route 144. The journey from the Expressway takes about 30 minutes. From the north and Nagano take route 406 south to the resort. By train from Tokyo, take the Ueda bound limited express service on the Shinetsu line. This journey takes about 2 hours and 20 minutes and there is a bus service from the station to the resort - this journey takes about 50 minutes. 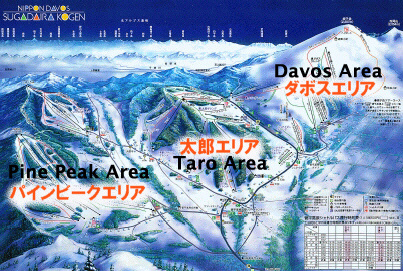 The Sugadaira resort has three main areas - Pine Beak Area, Taro Area and Davos Area. Details and images of each presented below. Insurance and nappies are provided. Charges are 500 yen for a half day and 1000 yen for a full day. Times are from 9am-11:30am and 1:30pm-4pm, with a maximum number of 20 people. For reservations call 0268 74 2138. 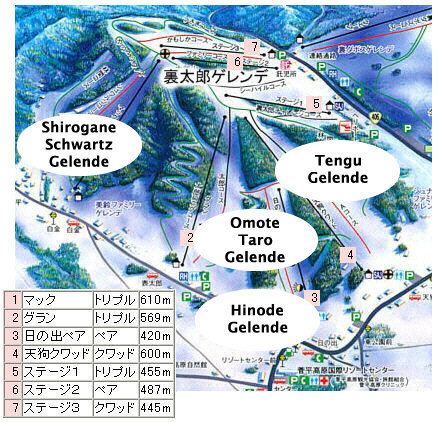 There are comprehensive medical facilities available at the Sugadaira Kogen Kokusai Resort Center, which can be contacted on 0268 74 2003.